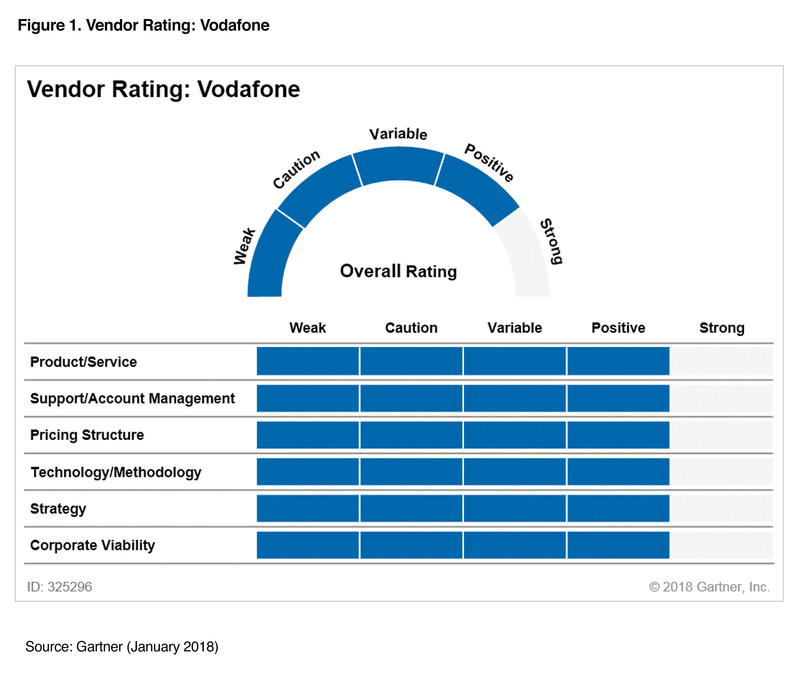 Gartner’s 2018 Vendor Rating identifies Vodafone as Positive. For the second year running, Gartner has evaluated Vodafone as Positive in its assessment of leading technology companies. Vodafone for Business was given an overall Positive out of five possible ratings ranging from Weak to Strong. We believe the Vendor Rating recognised us for our leading IoT capability and for extending our offering from mobile provision into converged communications. In developing new services we have become the best strategic partner for our customers as they undergo digital or business transformation. The breadth and depth of our global network was also acknowledged as a key part in the Positive rating. This aspect of our business is increasingly important to our customers, which include multinational enterprises looking for a global service covering mobile, fixed, IoT, UC and cloud. Vodafone was positioned as Positive in every subcategory. In terms of Support/Account Management this amounted to an improvement, since our 2017 rating in this area was Variable. The Vendor Rating process cited customer feedback that demonstrated an improvement in customer experience. We believe this is in part down to the concerted effort to better serve the needs of our customers by improving service management and operational efficiencies through our CXX and Digital Vodafone programmes. These programmes have also contributed to the step-up in our Net Promotor Score from 8.1 to 8.9 in the last year. We believe this Vendor Rating reflects the progress we have made in the past 12 months and how we have developed our unmatched enterprise service offering in order to help our customers succeed in the digital world. Three more reports we believe reflect the progress we’ve been making in helping our customers succeed in the digital world. For the fifth year running, Vodafone is named a Visionary in Gartner’s Magic Quadrant for Managed Mobility Services, Worldwide. Read the report now. Gartner positions Vodafone as a Leader in its 2018 Magic Quadrant for Managed M2M Services, Worldwide. This graphic was published by Gartner, Inc. as part of a larger research document and should be evaluated in the context of the entire document. Gartner does not endorse any vendor, product or service depicted in its research publications, and does not advise technology users to select only those vendors with the highest ratings or other designation. Gartner research publications consist of the opinions of Gartner's research organization and should not be construed as statements of fact. Gartner disclaims all warranties, expressed or implied, with respect to this research, including any warranties of merchantability or fitness for a particular purpose.